Dendrimers are a kind of macromolecule materials composed of central nuclei, repeating units and terminal groups. The dendritic topology leads to unique threedimensional architecture with mono-distribution at the nano-scale. Considerable attention has been focused on the high-efficient synthesis and potential applications of dendrimer in various fields such as biomedicine, catalysts, membrane materials and biosensors. Due to the precise structure and the abundant surface functional groups, dendrimers are useful biomedical materials. This review summarizes the present condition and development of the versatile dendrimers as biomaterials. We discuss synthetic methods, including divergence and convergence method, click reaction method, one pot method and supramolecular self-assembly method as well as the biomedical application such as tissue engineering, drug and gene delivery, biomedical imaging and sensing of dendrimers. 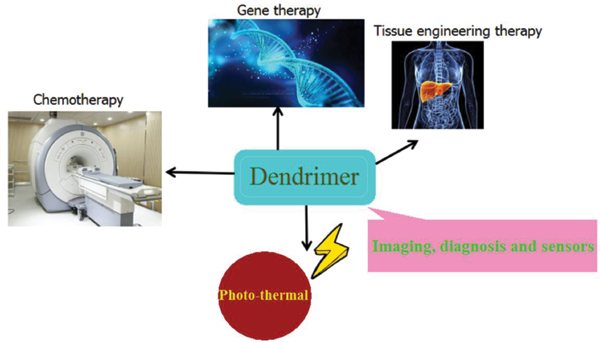 Dendrimer, Poly(amidoamine) dendrimers, synthetic dendrimers, drug delivery, genetic delivery, photothermic and photodynamic therapy, biomedical imaging.